Montgomery College President DeRionne Pollard justified her expensive, taxpayer-funded security detail by saying she needed protection as someone who will take controversial political stands. Pollard is delivering on that promise in the college's Fall 2017 course catalog. 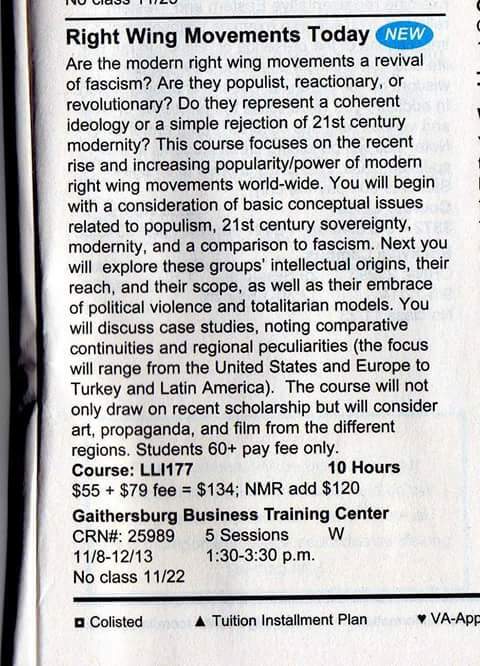 A "new" offering, "Right Wing Movements Today," has a course description that falsely claims that Americans to the right of the political spectrum embrace "political violence and totalitarian models." I've seen a lot of course descriptions, but this has to take the cake as the most intellectually-shallow and biased yet. It is spreading "fake news" as history, and smearing about half of the country in the process. The reality is that the only victim of physical political violence in Montgomery County was a Donald Trump supporter, and that 99% of the national violence during and after the 2016 election was carried out by left-wing groups, led by the ultra-violent Antifa. Yet, there is no course offering this fall on the "left-wing embrace of violence." Perhaps the worst thing we can do in these fractious times is to simply cut off debate and dialogue with those we disagree with. Even worse is to base your arguments on fictitious lies. Worst of all is using a taxpayer-funded platform to do it. This course is reminiscent of the attempts by the Montgomery County Council to create an atmosphere of fear and hate after last November's election. That directly led to violence against a Richard Montgomery High School student. "LL 177" is spreading its own brand of hate, at taxpayer expense. And by incorrectly teaching students that one side of the political spectrum is "violent," the course helps to dehumanize those Americans, which actually facilitates and encourages more left-wing violence of the sort we've seen in Berkeley, Chicago and elsewhere. This is not productive or constructive in any way. The professor may not agree with their positions or ideas, but right wing groups ranging from Republicans to the "alt-right" do not "embrace violence." Teaching students otherwise is morally bankrupt. Liberals resort to violence and intolerance just as much as anyone but the disgusting part is that they claim they are so progressive, peace-loving and tolerant. Sheer hypocrisy. By closing out free intelligent debate and branding anyone who disagrees with them as extremist and crazy, they proves they lack the very tolerance they preach. Disclaimer: this is not true for all but I've seen enough of it. "Disclaimer: this is not true"
This is a non-credit "Life Long Learning" course. It is the equivalent to a personal entertainment and enrichment exercise. Though you find the title off-putting, it's really not something to get upset about. Instead, get upset when students trying to earn credits can't get into classes because of budget cuts. 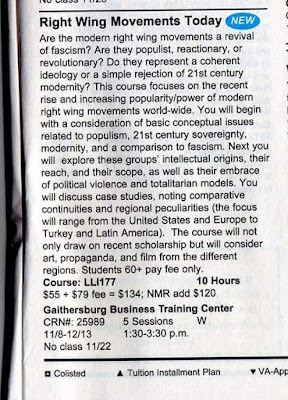 2:50: As a history major, I'll agree that this "course" does belong under the "personal entertainment" category. I am glad you agree. That being the case, please consider publishing a retraction noting that this is a NON CREDIT Life Long Learning Course that is for community members looking for entertainment and enrichment. I think you bashed Montgomery College unnecessarily.